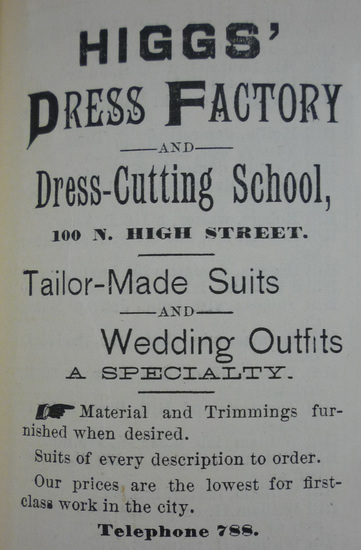 In the 1890s, Columbus had several instructors of and schools for dressmaking. Mrs. A. Kirschner taught both the Taylor’s and Persian Tailor System of cutting ladies garments. Mrs. C. F. Moll, the state manager of the Woman’s Industrial Association Building on South Fourth Street, ran the Ladies Tailor School of Cutting, which offered classes during the day or evening with German or English teachers. Thomas and Mary Higgs opened a dress factory and dress cutting school at 100 N. High St. in 1887. They had been listed as dressmakers in Columbus since at least 1880, having the entrance to their business in 1885-6 accessed through the White, Denman & Company’s Dry Goods store at 80-82 N. High Street. Their factory/school lasted less than ten years. By 1895 it was no longer in operation but Mr. Higgs was listed as the sole ladies’ tailor in town, a new category listing in the city directory, but one that would continue to grow in the 20th century. Of the dressmakers living and working in Columbus around the turn of the twentieth century, only three are represented in OSU’s Historic Costume & Textiles Collection (HCTC), Daisy Schaefer, Kate Hoffer and Mary McCormick. We are able to identify Daisy Schaefer and Kate Hoffer because they sewed labels into their garments with their names on them to identify their designs—Miss D. Schaefer, Columbus, Ohio and Hoffer, Columbus, Ohio. This was not a very common practice at the time. If it were, we would have many more garments with dressmaker names in them. Of course, Parisian couture garments had their designers’ labels in them, and it is likely that this practice was followed by the finer dressmakers throughout the fashion world. We only know about Mary McCormick through family history documents that identify her as Rose Lazarus’ dressmaker. We can only attribute the lace dress we own that belonged to Rose Lazarus as one made by Mary McCormick based on this information, because the dress does not have a dressmaker’s label in it.